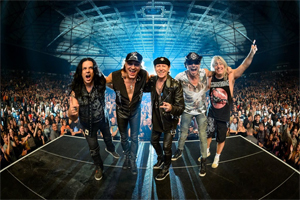 "I am extremely happy to announce that the SCORPIONS have rescheduled all the remaining American dates that we were forced to cancel last fall due to my severe laryngitis. I was so overwhelmed with all the love and well wishes from our fans when we had to cancel, that the band and I were determined to get back to the U.S. to make these dates up to our loyal and dedicated fans. I am also happy to say that QUEENSRYCHE will join us as well for these Crazy World shows! We look very much forward to seeing you out there and get ready to ROCK!," said singer Klaus Meine. Last fall, the band released the ballad compilation Born to Touch Your Feelings (Best of the Rock Ballads) via Sony Music. The release included two new songs: "Melrose Avenue" and "Always Be With You", as well as an acoustic version of "Send Me an Angel". Stream and download the album across all digital platforms. With over 100 million records sold around the world, the band will play fan favorites from their incredible catalogue including "Wind of Change", "Still Loving You", "Rock You Like a Hurricane", "Send Me an Angel" and many more. Founded in Hannover, West Germany in 1965, Scorpions were part of the first wave of metal in the 1970s with their debut album, Lonesome Crow, released in 1972. The band rose to arena status with seminal releases Lovedrive, Virgin Killer, and Animal Magnetism. In the '80s, SCORPIONS amassed a string of Billboard chart toppers from Love at First Sting and Blackout, including multiple Top 10 singles "Rock You Like a Hurricane" and "No One Like You", as well a string of successful singles such as "Send Me an Angel", "Still Loving You" and "Wind of Change". The band was also ranked #46 on VH1's Greatest Artists of Hard Rock and their hit "Rock You Like a Hurricane" also landed at #18 on VH1's list of the 100 Greatest Hard Rock Songs.